An essential part of every kitchen, whether for making pastries, bread, pizza, or all three! 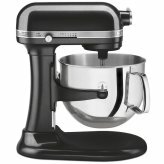 Find the right mixer for your kitchen. Increase your profits with an all-purpose dough mixer for your kitchen! Reduce labour cost and increase bakery production by selecting the proper mixer for your bakery, pizzeria, commercial or home kitchen. Varying in durability, we carry only the most trusted brands of restaurant equipment and appliances. Whether you are looking for a counter top mixer, floor model, planetary, or spiral mixer, you can find your dough preparation equipment here, at unbeatable prices! With countertop models starting at 5QTs, and floor models ranging from 30 QTs to 80 QTs, you will be sure to find the right size dough mixer for your kitchen. Outfit your dough mixing equipment with the necessary parts and accessories, with flat beaters, dough hooks and wire whips available for every size!